Hrmphh. 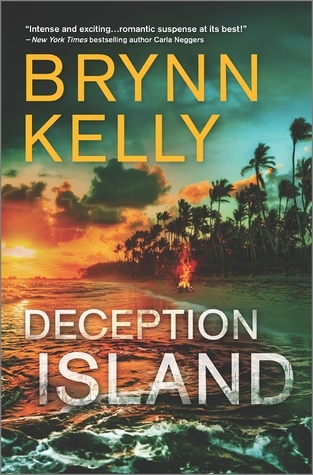 That is the only way to describe how I felt after reading Deception Island. It was a lot darker than I expected, with a lot of sad pieces all tied together. I don't know if I was ready for this kind of story when I picked it up but at the end I couldn't really say that I didn't enjoy it. There is a lot going on in this story, but the main focus is on Rafe and his quest to save his son from the mercenaries who took him. What unfolds is an adventure filled story with lots of twists and turns. Murder, despair, backstabbing; it is all part of this crazy story about a man trying to save his only son. As far as the romance between captor and detainee, there wasn't a lot of steam but there is definitely a lot of discussion about both Rafe and Holly overcoming their sordid pasts. I could have done without a lot of the self deprecating thoughts that the author included for both characters. I think it's pretty obvious by their past that neither character feels like they would be a good partner. The constant rehashing of their inadequate feelings took away from the story a bit for me. I can, however, say that I did enjoy the action and the surprises along the way. Pirates, fake kidnappings, human trafficking, mercenaries and bloodshed were not what I was expecting, but it was all tied together in a pretty natural way. I have to give the author credit, there weren't any lingering questions at the end. Final thoughts: If you're a fan of action, twists and a bit of romance thrown in, this will be a book that you'll greatly enjoy. Despite the expectations I may have had at the beginning, overall this was a good read.